A typical specimen from the author's home waters. TEN YEARS AGO, maybe even fifteen, you’d have gotten a strange look if you mentioned flyfishing for carp anywhere this side of the Atlantic. Since then, carp seem to have become the species everyone feels obliged to mention at least once. 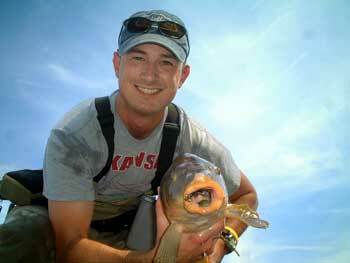 You see carp in magazines, in books, even on the occasional flyfishing television show. Although some of these articles and books have been very good, carp have still managed to slip under the radar of the American angling public. In Europe, carp fishing is an established and expanding sport. Whole magazines are dedicated to the species and anglers routinely make the local newspapers gripping-and-grinning these fish like they know something we don’t. After all, here in the United States the average angler would rather be photographed knee-deep in his sinking drift boat than be discovered to have hooked a carp, much less to have caught it and looked proud about doing so. Sure, some enlightened anglers have begun to target carp — usually out of curiosity or boredom with still more trout. But if you asked a guy on the street to tell you about carp, he’d give you a funny look and inform you, sonny, that carp are widely known to be the nastiest, slimiest, plug-ugliest, bottom-dwelling-est fish on the continent. So before I get into why I not only respect the species but actively seek to embarrass myself by catching them, maybe a brief review of the carp’s less-than-noble history in the United States is in order. How Did an Overgrown Asian Goldfish Get in My Trout Stream? 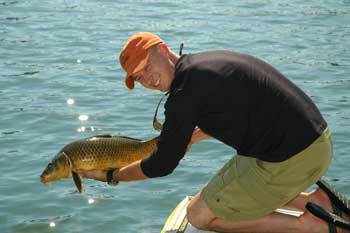 The common carp, cyprinus carpio, is nothing more and nothing less than the largest minnow in the world. (Before your prejudices are confirmed, look into the noble tarpon’s not-so-prestigious relationship with the common herring, the silver king’s ‘other side of the sheets’ little brother). Although the carp is native to central Asia, it was intentionally introduced in the United States in the 19th century, as (you guessed it) a fast growing, cheap and potentially abundant source of food for the expanding nation. Unfortunately, the carp’s greatest strength, its superhero tolerance for pollutants and poor living conditions, turned out to be its Achilles’ heel. Compare, for example, late 20th century tests of the 1600 most common pollutants in United States waters (of which only 135 were found to be fatal to carp) with the many ways one can kill an average rainbow trout. Trout roll over like kryptonite was dumped in the stream if a heavy rain falls in the neighboring county. Yet, it is this very tolerance that has given carp such a bad name. After all, who wants to catch a fish that lives in the cesspool behind the office parking lot, casting between Styrofoam cups? Ah, but correlation does not equal causation, my friend. In deeper water, bring heavier tackle, as carp will sound for the bottom. Just because a carp can live in the worst conditions does not mean all carp do live in the worst conditions. The two best places to catch carp in my home area are the local trout stream and the local lake, a source of drinking water for the city. Moreover, few practical fly-fishing locales are likely to be as polluted as that storm drain behind the office complex. Remember that a carp’s tolerance range includes the beautiful as well as the ugly, and that clean rivers make for clean fish. Ok, Assuming I Might Want to Catch Them, How Do I Do It? The most common misconception about carp fishing is that it is easy. It isn’t. People assume that carp are easy to catch for the same reason they assume all carp are diseased: nothing that ugly could be difficult to trick. Fortunately, this second belief is just as flawed as the first. Carp are, in all likelihood, the spookiest, trickiest, smartest fish found in the waters of the United States. They have phenomenally sensitive mouths equipped with chemically receptive cells which allow the carp to distinguish food from foe in an instant. In addition, carp actually have nostrils, small holes near the eye sockets which flush in water and allow the carp to sample its surroundings like a lizard testing the air with its tongue. 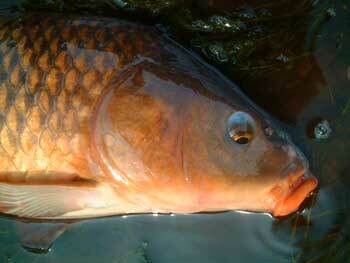 Once spooked, a carp emits an alarm pheromone which alerts other carp to the danger. Thus, one shot is often all you get, even in waters where the carp experience no fishing pressure. The best thing about carp fishing in the United States is the availability of fish and water. Ever wonder what trout fishing in the early 17th century would have been like? Visions of empty water chock full of uneducated fish swim before the eyes; the angler versus the fish with only the fish’s native wiliness to avail it. Those days are gone, friend. If there’s a trout inside the United States that has yet to see a wooly bugger it either lives inside a volcano or it will soon be riding in a hatchery truck. Carp, however, may as well be new to this earth. Europe, as mentioned, has organized carp angling which selects for educated fish, mimicking the arms race that has already occurred between North American anglers and salmonids. Carp, with such an impressive biological arsenal already at their command, are certain to quickly reach new levels of uncatchability once angling pressure begins in earnest. And, just as saltwater fishing opened up in the previous decades, so too will carp fishing in the coming years. The nature of our expanding population and diminishing trout resources practically make a growing carp fishery inevitable, and if you don’t yet believe it, look to Europe. Crazy Charlies are as likely as any fly to take trophy carp, and they snag much less. The tools for catching carp were largely developed in the great saltwater laboratories of the past decade or so. Although blind fishing is an option, the thrill of catching carp is in the stalk, just as it is with redfish and bonefish, so I focus on sight-fishing alone. Carp in common conditions can easily cross twenty pounds, so be prepared with strong tackle appropriate to the situation. Eight weights with high-end reels are appropriate for river situations, but consider scaling up to a ten weight if you target carp in waters deep enough for them to sound. Horsing a carp out from under a dock is particularly difficult. Pay close attention to the terminal tackle. Most modern saltwater lines are merely adequate for carp fishing, which often demands trout-like presentations with larger food sources. Avoid bass bugs and other tapers which might turn a fly over too aggressively. Use tapered leaders at least as long as the rod, but use the strongest leader material you can get away with. Ten pound Climax fluorocarbon is my usual tippet. Flies range from my personal favorite, the Crazy Charlie in whatever color matches the stream bottom, to orange-headed wooly buggers in white and olive, and egg-patterns colored to resemble mulberries, corn, or trout eggs. Choose patterns based on the vegetable as well as animal sides of the menu, because carp are omnivorous. Additionally, have a look around the web. Carp fishers are scattered widely enough for some real regional varieties to develop in fly selection, and most of the best patterns aren’t commercially available. Carp are at their trickiest, and most rewarding, when the sun is high and the water is slick. Although I am not above chumming up some lake carp for a quick evening of bulldogging some fish, I find the early afternoon carp stalk to be among the most entertaining forms of fly-fishing I have experienced. Wear polarized sunglasses and locate a section of your local carp water, whether river or lake, which allows for shallow wading. Even granddaddy carp will tail in less than six inches of water. Begin your stalk upriver (or upwind in still water), with the sun wherever you can see ahead of you best. I find it helps to use the reflections of trees or nearby hills to cut some of the glare off the water. Again, polaroids are absolutely not optional: you need them avoid wasting your time. Carp will skim across the flats seemingly at random, sometimes holding in predictable patterns and sometimes meandering about. Usually they are looking for food, which they attack by hoovering up the sediment and filtering out crustaceans, plant matter, and bugs. Just as a bonefish puffs away at the bottom, so will a carp root for his dinner. In deeper water, carp will sip debris lines just like trout, picking mayflies, caddisflies, or seedpods off the surface with an audible slurp. Vibrant colors can lend a unique beauty to an oft-maligned species. On the flat, approach the carp from “over his shoulder,” and carefully wade as close as necessary for a really clean cast. For the best results with a ten-pound carp (my target size with an eight weight) you will want to be able to hit a three-inch target thirty feet away. That three-inch strike zone is usually immediately “behind his ear,” or in the slot just between his pectoral fin and his eye, approximately six inches away from the fish. Cast for distance first as the fish are not line shy, then lay the fly in with an audible plop (but not a splash). If you are lucky, the carp will turn to see a potential food source drifting down and will grab before the adage about being too good to be true finishes flashing before his eyes. This cast usually gets me about 50-50 results when I nail it. Some carp will blow out of the pool the minute the fly makes contact. Because of those chemical signals, the best bet is to wade to the bank and start over a couple hundred feet away. 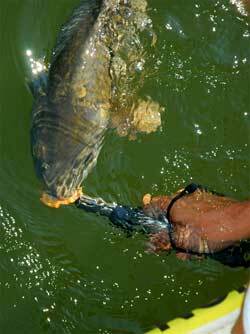 Another approach makes use of the carp’s feeding proclivities. Like a bonefish, carp often spot prey by the puffs of sediment the critters send up when scurrying away from danger. When you see a carp prowling for food, lead your fishy receiver like a quarterback by just a few yards and give your fly time to sink. I particularly enjoy this method with a Crazy Charlie or similar hook-upwards pattern. Let the fly settle, then when the carp comes in range, twitch it just enough to stir up some dust. Usually, the carp will be on you like a duck on a June bug. Carp are dogged, never-say-die fighters. On light saltwater tackle, in a river, you have a good chance of landing even a large specimen. In open water, plan for some power-cleaning. The first time I fair hooked a carp, no chum and all hands aboveboard, was on a cane 5 weight with an outdated Orvis Battenkill 5/6 disc drag reel. I broke him off just as he was getting up to plane — thirty feet into my backing! Two other jumbo specimens played me the same song that day, but I came back better armed with an eight weight and a saltwater-class reel. Dial your drag up to ‘never say die’ and lean into the fish. Carp fight like a cross between a redfish and a bonefish — hard, jagged runs, one after another, and a net-run at the finish for certain. Nothing short of a full grown striper will pull like that in most rivers where carp are found. In a river, play the carp like you would a really big trout, turning his head at the end of a run and working him against the current. If you don’t have a buddy with a really big net handy, let him waterski himself across the current and right out onto the bank, where you can subdue him. As Lefty Kreh says, “don’t burn your golf balls” – treat the fish right and release him with as much care as you would a baby brookie. Besides taking natural selection and the inevitable arms race out of the picture, it is just the decent thing to do. If you want to try eating a carp, be my guest. I may be enlightened but some cooties really stick. I may have referred to carp as ‘plug ugly’ a time or two in the past. I did this before I really came to know them. No carp I have landed to date has been anything short of elegant. If redfish with their beauty spots and bonefish with their sucker mouths can grace the covers of our finer fishing magazines, carp deserve their shot too. This is a pleasure that is certain not to last. The golden days of empty rivers and screwball looks can only last so long, friends, and though I drive in a nail by saying so, you really must try this.